Debbie Cerda's monthly beer-and-booze-and-movies column. A lot has changed since Alamo Drafthouse South Lamar last hosted Fantastic Fest, in 2012. 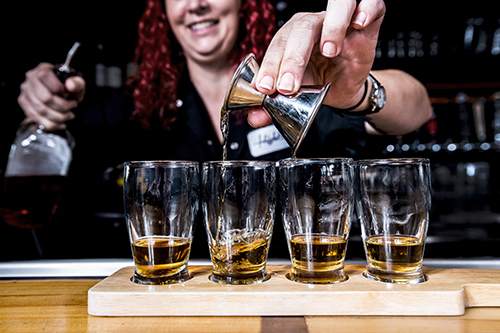 The craft beer scene across the nation continues to grow, and both Austin and the Alamo Drafthouse offer fabulous selections to demonstrate the dedication and passion that brewers and beer enthusiasts have for a good brew. Texas has experienced a welcome growth of local craft breweries along with an influx of world-renowned breweries from across the United States -- Firestone Walker Brewing Company, Epic Brewing, Founders Brewing, Odell Brewing are just a few on local tap walls. Alamo Drafthouse recently announced the launch of a new beer program, featuring a new style every month. This month's offering is Octoberfest, a deep gold to copper-colored lager that typically features bright clarity and a solid, off-white head. This style is composed of Vienna and Munich malts that contributes a toasty caramel and rich melanoidin character with some moderate hop bitterness and mild sweetness. Current Octoberfest selections on tap at Alamo South Lamar include the traditional Ayinger Oktober Fest-Märzen as well as Texas favorites -- Real Ale Brewing Company's Oktoberfest, Houston's Karbach Brewing Company Karbachtoberfest and Port Spiral Oktoberfest. It's difficult to even begin to describe the phenomenal growth and activity in the craft beer industry this year, but it's evident from the number of selections on tap and on retailers' shelves that craft brewing is booming. As the number of Texas craft breweries increases, existing ones are prospering with brewery expansions and new beer offerings. Filmmaker Mike Mann (Brewed) and host Greg Zeschuk have been documenting and sharing stories from many of these Texas breweries through their ongoing web series, The Beer Diaries. Zeschuk recently visited the brewers of Kamala Brewing at the Whip In (pictured at top), an award-winning brewpub here in Austin. Another recent episode features the first cooperatively owned and managed brewpub in the world, Black Star Co-op Pub and Brewery, and an upcoming show takes viewers behind the scenes of the Spoetzl Brewery in Shiner. Check out one of my favorites below featuring Live Oak Brewing Company founder Chip McElroy. Sam Calagione of Dogfish Head Craft Brewery returns to Austin for the seventh annual Off-Centered Film Fest at Alamo Drafthouse. This year's theme for the multi-day event is "Stuntin'," dedicated to the daredevil spirit. 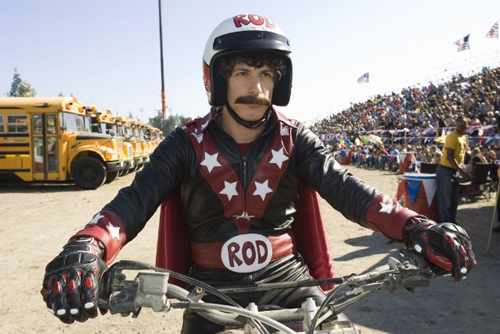 The opening celebration will be held at Fiesta Gardens on Thursday, April 24 at 6 pm, with an outdoor 35mm screening of the comedy Hot Rod, starring Andy Samberg. Special guests for the evening event's include The Lonely Island -- Andy Samberg, Akiva Schaffer and Jorma Taccone, as well as Calagione and representatives of the Central Texas brewing community. Ticket sales will also include an option to donate to the Texas Craft Brewers Guild (TCBG). "We are extremely pleased to have the support of Alamo Drafthouse and Sam Calagione, and this tangibly demonstrates of the collaborative nature of American craft brewers," said Charles Vallhonrat, TCBG executive director. "This event is a great opportunity to showcase some of the wonderful craft beers that are available in Texas from both Dogfish and our Texas brewers, while supporting the work of the Guild to educate, advocate and promote for Texas craft beer." The 80th anniversary of the repeal of Prohibition was marked earlier this month with special events at local bars and brewpubs. Local PBS station KLRU re-aired the 2011 Ken Burns three-part documentary Prohibition. Directed by Burns and Lynn Novick, this fascinating series documents the contributing factors of Victorian-age morality and events that led to the passage of the 18th Amendment that prohibited alcohol. If you missed the rebroadcast of Prohibition, you can watch this well-crafted documentary on Netflix or iTunes. Prohibition is also available to rent at both locations of Vulcan Video. Rogness Brewing Company offers a monthly film event at the brewery, and the featured film on Saturday, December 21 is indie comedy Cinema Six, which was filmed in Central Texas. Mark Potts wrote and directed this humorous film, and I'm sure some local cast (seen at top) and crew will be in attendance at this free event. The screening starts at 7 pm, and pints of Rogness Brewing craft beer will be available for purchase in the tasting room. Over 49,000 beer enthusiasts descended upon Denver, Colorado for the Great American Beer Festival (GABF) earlier this month, and Texas craft beer was well-represented. This year’s festival competition featured 732 breweries from around the United States entering 4,809 brews to be judged and distinguished as the best of American craft ales, lagers and specialty libations. 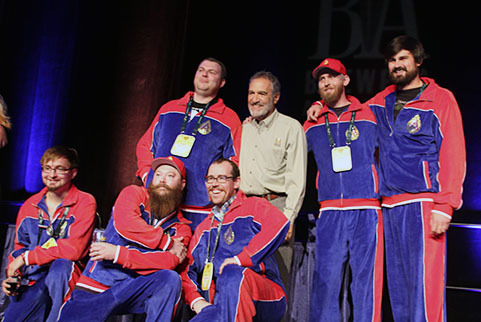 Texas brewers received 10 awards this year with four gold, two silver and four bronze medals, including a gold to Austin Beerworks (seen at top with Brewers Association President Charlie Papazian) for their Black Thunder German-style schwarz beer. In addition to Texas brewers, several Austin film-related projects and businesses took part in the festivities surrounding GABF. Alamo Drafthouse's Beverage Director Bill Norris and Creative Director John Gross made the trip to Denver, with Gross moderating "The Business of Fun: Beyond The Beer" panel. North by Northwest founder Davis Tucker was on the panel along with representatives from Odell's Brewing and Oskar Blues, discussing how craft beer goes beyond just drinking and brewing and supports many other business sectors including marketing and design. It's been a busy month for Alamo Drafthouse founder and CEO Tim League with new locations opening across the "Magnited States of America," from north Austin to Dallas/Fort Worth and even Yonkers, New York. I was most excited by the new location at Lakeline, the largest Drafthouse location to date with ten screens and a craft beer-themed bar. 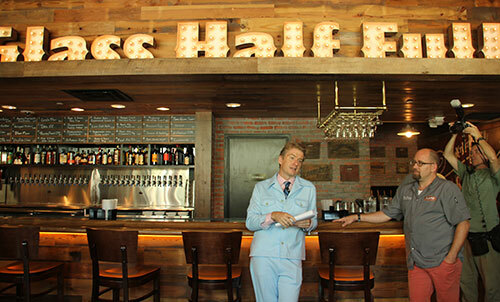 Glass Half Full offers a 32 craft beer lineup, including 9 rotating taps of special and season beer selections comprised mostly of Texas brews. The intriguing beer cocktails and mixes concocted by Drafthouse beverage director Bill Norris are a refreshing re-imagining of craft beer libations. My personal favorites so far include the "Elderflower Snake Bite" made up of Pearlsnap Pils and Ace Cider with a hint of St. Germain, and the "Hopalong Cassidy" made of Old Tom Gin, Cointreau, fresh grapefruit and India Pale Ale syrup, which has converted me from a non-gin drinker. Folks in the Dallas/Fort Worth area can finally enjoy the food and drink offerings of Alamo Drafthouse at the newly opened the Richardson location. which features an extensive and impressive wine, beer and cocktail menu. In addition to the Silence of the Lambs Suit Yourself Pinot Grigio and The Cannibal Chianti, I noticed the aptly titled Kung Fu Girl Riesling and Norton Reserva Malbec -- be ready for some interesting Sommelier Cinema pairings with James Wallace as Dallas/Fort Worth creative manager. The stellar beer selection features the high-caliber diversity of DFW regional craft breweries, including Lakewood Brewing Co. Temptress Stout, Peticolas Brewing Company Velvet Hammer Strong Ale, Revolver Brewing Blood & Honey Pale Wheat Ale and Deep Ellum Brewing IPA. Registration for breweries participating in the 2013 Great American Beer Festival held annually in Denver opened last week, and the 600-plus slots sold out in a record time of less than two hours. Despite the efforts of host organization Brewers Association to increase the number of participating breweries for this year's three-day event, over 300 breweries and brewpubs are currently on the waitlist. This overwhelming demand is indicative of the incredible growth of craft beer across the United States. Two beer documentaries that capture this growth, featuring Central Texas craft breweries I covered in my January 2012 Film on Tap column, are finally screening in Austin. 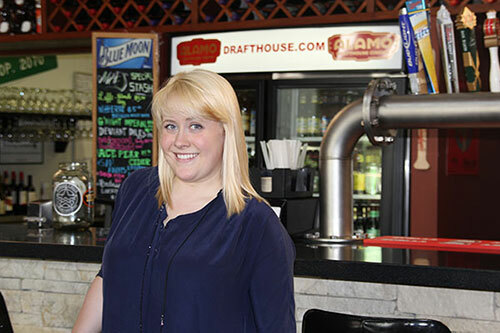 Chris Erlon hosted a cast and crew screening of his Brewed in Austin in June, and is in discussion about more screenings as part of the Alamo Drafthouse's "Meet the Brewers" special event series. Alamo Drafthouse continues to support local craft brewers with the Austin premiere of beer documentary Crafting a Nation as the opening feature for this summer's Rolling Roadshow series at Jester King Craft Brewery on Thursday, July 18. This film features many craft beer-related individuals and businesses in Central Texas as well as across the nation that are part of the current American craft beer movement. 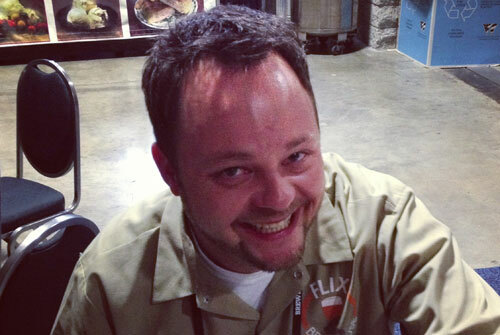 Tragic news in our community derailed my week: Walt Powell, Vice President of Operations at Hospitality Investors, Inc. and co-founder of Flix Brewhouse, passed away unexpectedly on June 4 at age 33. On Tuesday, June 18 at 1 pm, Flix Brewhouse will host a memorial service for Walt. The event is open to anyone and everyone who was affected by the loss, to share stories and raise a pint to Walt, self-proclaimed beer geek. I find myself struggling between the professional responsibilities of covering a local newsworthy film community event and processing the loss of a dear friend. I've repeatedly had the impulse to vet my facts through the source -- Walt himself -- with the realization that he's gone. The most difficult part of writing this memoriam was not being ready to write in the past tense, something anyone can identify with after the loss of a loved one. However, the importance of memorializing a valuable and well-respected man in our local film and beer communities far outweighs these difficulties. Walt and I were vaguely acquainted many years ago when he was general manager at Main Event Entertainment in northwest Austin. Being a Dave and Buster's alum myself, I teased him about it being a "D&B wannabee." Walt's reaction was to brag about his staff, ask me for my feedback, and challenge me to compete in skeeball. The Brewers Association proclaimed May 13 - 19 as this year's American Craft Beer Week, which means film-and-beer events are taking place across the nation. Just down the road in San Antonio, the documentary Crafting a Nation premiered at the Alamo Drafthouse Stone Oak last evening. Unfortunately I missed the screening, but I did get to the premiere after-party at Freetail Brewing Company. 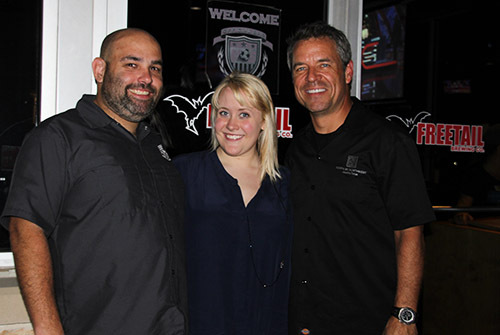 There I caught up with producer Courtney Cobb and a couple of the featured subjects in the film: Scott Metzger of Freetail and Davis Tucker of North by Northwest Restaurant and Brewery (pictured above with Cobb). The Crafting a Nation filmmaking team has been traveling across the U.S. this week with their film -- director Tom Kolicko hosted the San Diego screening. Cobb reports that the team is holding off on the Austin premiere so that they can "do it up really big" since central Texas was a featured region of the film. I heard a few of the audience members got a bit teary-eyed during a couple of scenes, and hope to see the movie for myself in Austin soon.